Many people fall into the trap of thinking that they only need to worry about their boiler during the cold winter months. This simply isn’t true. Servicing your boiler regularly ensures that you prevent any nasty surprises and unexpected costs. The summer is the perfect time to have your boiler serviced. You can rest assured that when the temperature starts to drop, and you need your heating, there won’t be any problems. We recently visited a customer who hadn’t had their boiler serviced for 8 years. They had a failed burner gasket which, if left unchecked, causes considerable damage to the boiler. This is due to the products of combustion escaping to critical boiler components. 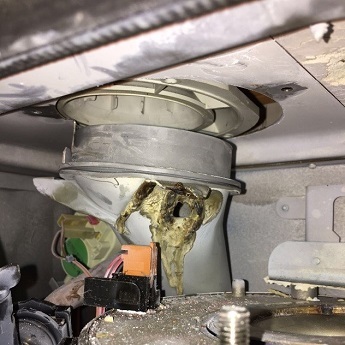 The result was a perished inner flue and products of combustion leaking into the boiler casing and surrounding area. This is a serious, potentially fatal fault for the customer. However, the situation could have easily been avoided with regular annual maintenance of the boiler. When was the last time you had a professional take a close look at your boiler? At Carshalton Boilers we are currently running a promotion. All boiler services booked before the 31st August 2018 are eligible for a discount on the usual cost. For details click on our Summer boiler service special offer page. Carshalton Boilers are a family run business with over 50 years’ experience in the plumbing and heating industry. Our expert engineers cover South London, Surrey and surrounding areas. Contact us today or call on 0208 3958060 for any advice or to book your boiler in for a service.